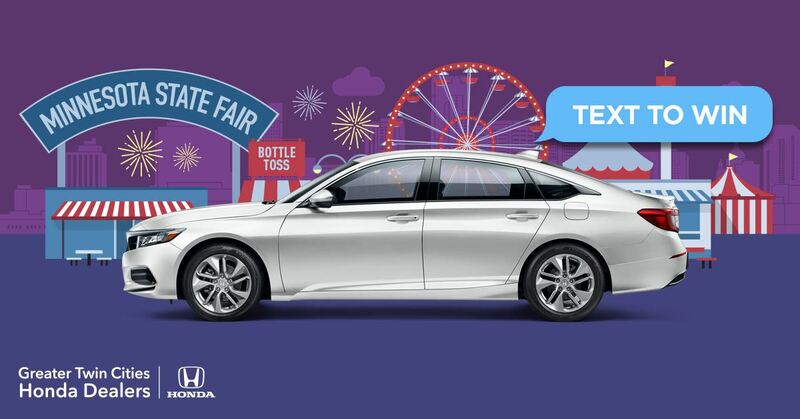 GTCHDA will be giving away two all-new 2018 Accords at the Minnesota State Fair. ST. PAUL, Minn. - Aug. 22, 2018 - PRLog -- The Greater Twin Cities Honda Dealers Association (GTCHDA), in partnership with iHeartRadio, will be showcasing three new 2018 Honda Accords and giving two away at the 2018 Minnesota State Fair, starting Aug. 23 – Sept. 3. To enter the giveaway, attendees must text keywords provided by booths at the fair, or by registering on contest pages of participating stations. Many of these booths can be found in a more convenient, central location near the grandstand. Participating radio stations include KDWB (101.3 FM), KEEY (K102 FM), KQQL (KOOL 108 FM), KTCZ (Cities 97.1 FM), KFAN (100.3 FM), and KTLK Radio (Twin Cities News Talk 1130 AM). Two winners will be selected at the close of the fair on Sept. 3. "The GTCHDA's participation in the Great Minnesota Get-Together is always a highlight of our year," remarked Tim Carter of Richfield Bloomington Honda. "It warms our hearts to see our friends and neighbors create something truly wonderful together, and we can't wait to award the 2018 Accord to two of those very people." Honda was named Kelley Blue Book's Best Overall Brand of 2018, with the Accord serving as one of the most awarded vehicles, taking home the Best Buy Award: Overall Winner, the Best Buy: Midsize Car, and the 2018 North American Car of the Year Award. For more information, visit KBB.com and northamericancaroftheyear.org. With three advanced powertrains, a revolutionary new design and Honda Sensing® standard on all models, the Accord is the most impressive Honda yet. A perennial best seller, the Accord is America's top selling mid-sized sedan, and its bold redesign promises to continue the trend. The all-new 2018 Accord will be displayed at the following booths around the fair: GTCHDA, KFAN/Cities97.1, K102, and KDWB/Kool108. Booth locations at the fair and other information may be found at https://www.mnstatefair.org.